The Hamer Guitar story is a most interesting tale that began as early as 1970 when graphic designer Jol Dantzig became a partner in a Chicago guitar shop called Northern Prairie Music. Northern Prairie was one of the first vintage guitar shops in the US. Northern Prairie did warranty work for Gibson, so they had a lot of knowledge about how the guitar was made and how to repair it and put it together. They also worked repairing guitars for other companies. Both of the partners wanted guitars that were constructer better than the ones they repaired. Though their main business concern was to sell and trade guitars, it was in 1973, that Dantzig built the first Hamer guitar. This was a Flying Vee bass. This process of creating instruments, at first, became an important part of their business. 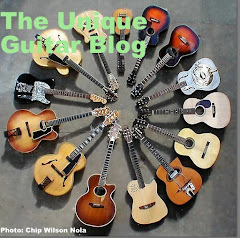 After completing their 10th guitar, they knew building guitars was their business. Hamer or Dantzig would show them one of their models. Being located in a major city was helpful in spreading the word about Hamer Guitars, plus they had some connections with big name players. Interestingly enough, when Gibson introduced the Explorer in 1959, they could not give it away. When Hamer found success with The Special, you had better believe Gibson took note and reintroduced The Explorer. In 1974, Hamer and Dantzig took out advertisements in popular guitar magazines. These were the days before anyone else was producing boutique guitars. Hamer was the first to take on this task. In 1977 Cheap Trick guitarist, Rick Nielsen, became acquainted with Hamer and endorsed their instruments. 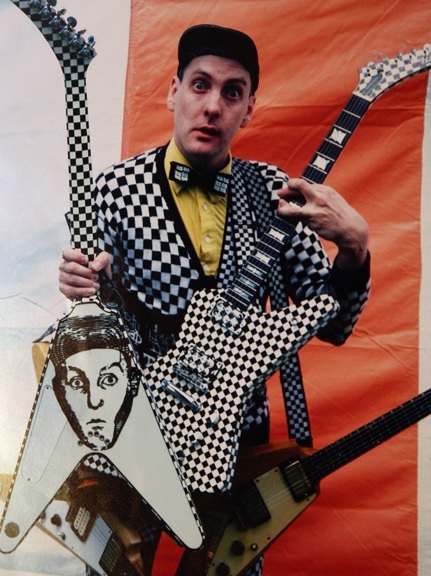 Dantzig had discovered a way to imprint graphics on a guitar and convinced the 3M Corporation to invent a new kind of tape that would make production of checkerboard guitars easier. Whatever strange guitar request Nielsen made, Dantzig and Hamer were able to produce. 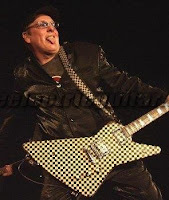 Tom Petersson, also of Cheap Trick, asked Hamer to build a 12 string bass. Up until then, the only company to build a bass with double courses was Hagstrom with its eight-string model. The 12 string Hamer bass was a first and not only did it have 12 strings, it was also quadraphonic. The bass had a miniaturized mixer built into the controls so each course of strings could be placed anywhere in a quad mix. One of the craziest things about Hamer Guitars is Paul Hamer and Jol Dantzig were not even 30 years old at this time. Well known band personnel such as Wishbone Ash's Martin.Turner, Bad Company's Boz Burrell and Mick Ralphs, and Jethro Tull's Ian Anderson and Martin Barre, Paul Stanley of KISS, Warren Zevon, Lita Ford, Tommy Bolin, Dave Hlubek of Molly Hatchet, Pete Townsend and John Entwhiste were all Hamer users. 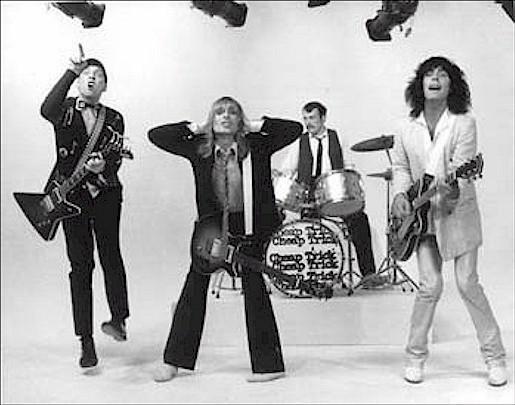 However, it was Cheap Trick that put Hamer on the map. Hamer had come up with all these fancy and bizarre guitars for Nielsen. 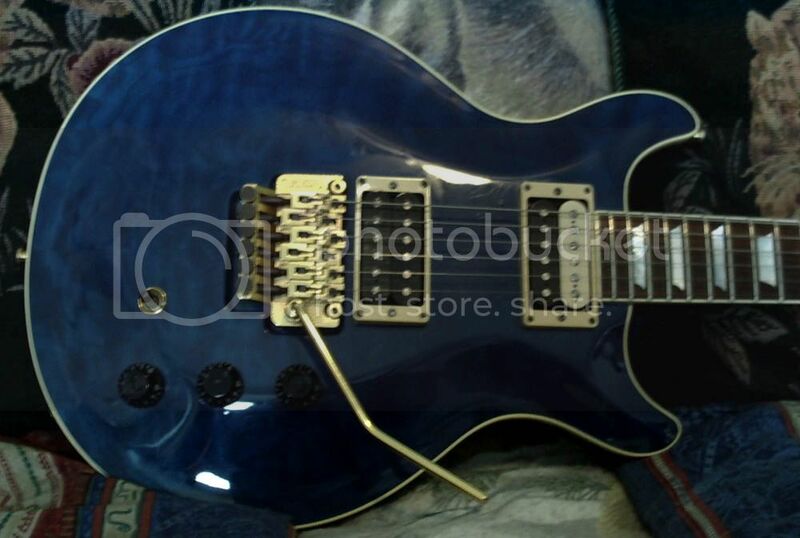 Nielsen also purchased guitars from Hamer that were customized to his specification. The first production Hamer guitar, called The Standard, was an Explorer shaped guitar. The body was British mahogany and the fretboard was ebony or rosewood. There were Standards made through 1978 and these were all handmade. The hockey-stick headstock was somewhat different from the original Gibson Explorer. From 1975 to 1985, Hamer built approximately 750 Standards. The Standard became the company’s flagship guitar and at the time sold for around $1200. It originally sold for around $800 in 1975. Pickups on Hamers made in 1977 and before were genuine Gibson PAF's that they purchase from old parts at the Gibson factory in Kalamazoo. After 1977, Hamer used DiMarzio or Seymour Duncan pickups. 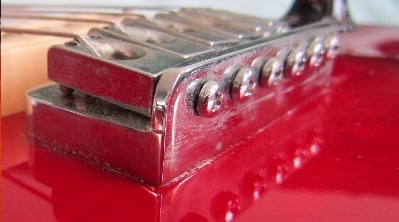 Later Hamer manufactured their own pickups, called Hamer Slammers. 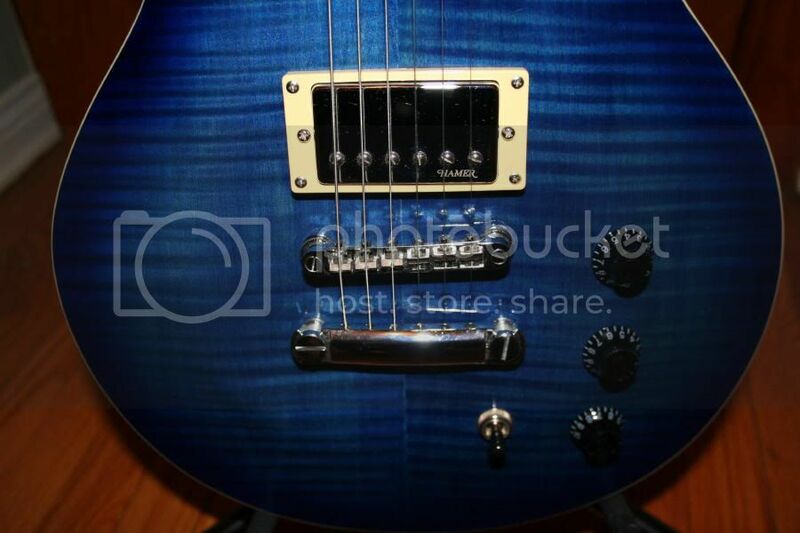 Interestingly, Hamer had the pickups mounted with no pickup covers and was the first company to take this approach. They had the pickups specifically designed with cream and black bobbins. Grover tuners were used on the neck and all instruments had a tune-o-matic bridge and stop tailpiece. The guitars were 24.75” scale, similar to Gibson’s standard. The guitars came with individual volume controls and one tone control. Dantzig worked on that tone control. Many of us find our guitars tone control provides only subtle differences based on turning the capacitor on or off. Dantzig made sure the tone control gave a full contour of sounds. Hamers came with a 3-way toggle switch. The bridge was what Hamer called The Sustain Block. This was somewhat similar unit to that found on a hard tail Stratocaster, with the strings going through the body; however the aluminum bridge was mounted on a raised shim of either rosewood or ebony. The Sunburst Archtops shape had its basis on the Les Paul Jr. Double cutaway. However, it was certainly an improvement. The arched top was finished in a variety of colours. The Honduras mahogany body was beautifully polished. The controls were similar, with twin volume knobs and a master tone knob and the toggle switch placed on the bottom bout, behind the bridge, where it was out of the way. The 22 fret fingerboards were rosewood with trapezoidal or dot inlays. The headstock bore Grover kidney bean tuners on early models. Later productions used Schaller tuners. The Sunburst was the first guitar to have Hamer’s familiar trapezoidal headstock with the indention. These instruments came with DiMarzios or Seymour Duncans, which were wired out of phase. Prototypes were on display at the 1977 NAMM Show. It proved to be one of Hamer’s most popular guitars with some 1500 guitar built by 1980. By the time the company moved to Arlington Heights they were producing 2000 Sunbursts per year. Some later models, produced by Kaman, used a flat top instead of the arch. The Hamer Special was a Sunburst without any of the frills. 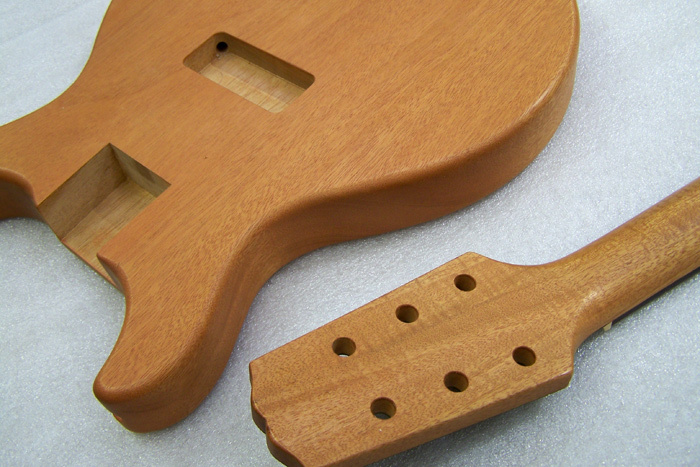 The two-piece mahogany body had a thin maple top. Body and neck were unbound and position markers were dots on the 22-fret fingerboard. Hardware included Schaller tuners and the Sustain Block Bridge. The guitar came in a variety of colours. A Floyd Rose Tremolo System was an option. By the early to mid 1990’s, the guitar was available with a flamed maple top. It is interesting to note that Hamer was the first guitar manufacturer to utilize the Floyd Rose Tremolo system on their instruments. Additionally, they were the first to produce guitars with locking tuners. Because the Floyd Rose system on many of their instruments was black-plated, Hamer also was the first to utilize black hardware.>By 1978, Hamer set its sights on world markets. By 1980 production warranted moving to larger quarters in Arlington Heights, Illinois due to rapid sales expansion. 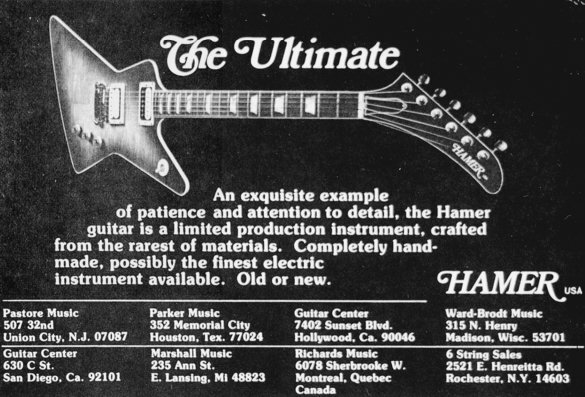 It was in 1981 when Hamer introduced a custom order Vee style guitar they called The Vector. The Vector had similar accoutrements as the aforementioned guitars on a Honduras mahogany top that could be ordered with or without a maple top, in a variety of colours. Tuners were made by Schaller. It also came with the Hamer Sustain Block Bridge. 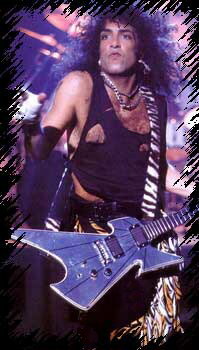 During the 1980’s and the age of Metal and Hair Bands, Hamer introduced some guitars aimed at this market. The Scepter was based on another Hamer Explorer guitar called the Blitz. The Blitz was more of an affordable basic model. The body was beveled and it came with a Floyd Rose Tremolo system. The Scepter V was an updated version of the Vector. It too came with a beveled body and boomerang inlays. 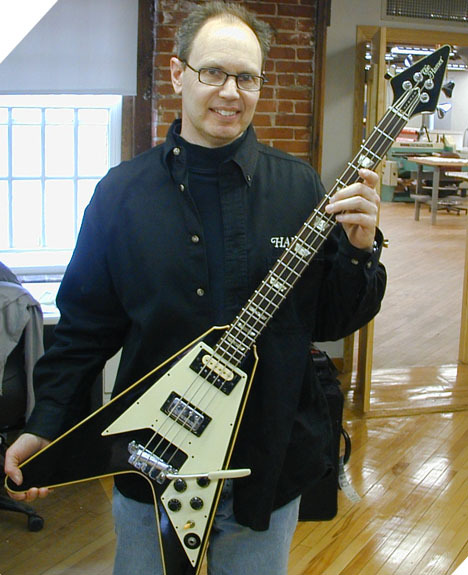 The Hamer Scarab had its basis in the Explorer style body, but the guitars bottom had a unique curved cleft cut. During the Metal years, Hamer came up with some interesting concepts, which included adding 27 frets to the neck, adding 36 frets to the neck, introducing a fretless guitar, introducing a 3 coil humbucking pickup, adding hologram images to the body, and they were the first to introduce a seven string guitar. Early on, Dantzig had recognized the issue of stress on the neck. Because of this Hamer changed building techniques to use three-piece maple that was made so the center strip had the wood grain reversed from the outer laminates. 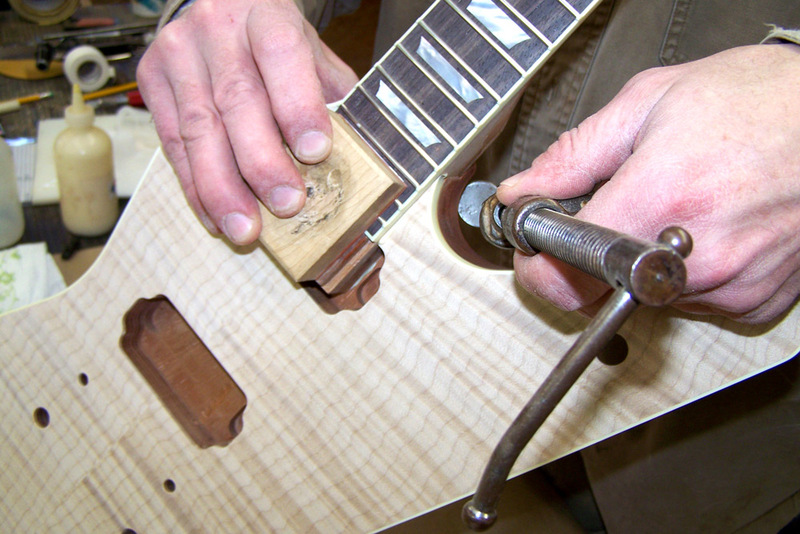 This is a method utilized by a number of guitar manufacturers and prevents warping. The necks are dovetailed into a hand- chiseled cavity for a tight fit. The control cavity is flawless and painted with nickel-based paint, then covered with an anodized aluminum cover. This prevents RF interference and hum. The bodies and necks receive a special method of applying lacquer to assure a beautiful finish. By 1987, Paul Hamer left the company that carried his name. He served as sales manager and was ready to move on to another career. In 1988, Kaman Music, the parent company of Ovation guitars purchased Hamer and moved manufacture ring to Hartford Connecticut. Dantzig left Hamer five years later, but returned as a technical consultant in 1997. At the end of 2007, Kaman Inc sold its music division to Fender Musical Instrument Company. Dantzig stayed on until 2010 and left to start his own high-end, boutique guitar company, known as Dantzig Guitar Design. Hamers current ownership has recognized “the times, they are a’changin’”, and has abandoned to Metal market to take a more traditional approach to guitar design. Hamer still offers its original models, including the 12 string bass and the Vector bass. They have introduced the Duotone, which has a belly bridge with a piezo pickup in addition to the humbuckers and the Hamer Artist, which has sort of a PRS shape. Hamer manufactures its guitars in the USA, but also produces the Hamer XT series of Asian made guitars that have a considerably less expensive price tag. One very interesting fact about Hamer concerns Dean Zelinsky, the young creator of Dean Guitars. Dean worked as a roadie for Dantzig and Hamers band. Dean took advantage of his lessons from watching and being with these fellows. It was after that experience when he launched his own business. The multitude of factual errors in this post boggle my mind.